There's major tension from start to finish and not a zombie in sight. That has been the direction The Walking Dead has been taking more and more each season. Yes, walkers remain a constant threat, but it's the living that have proven to deliver the most conflict, and that's demonstrated well in the above sequence, particularly in the introduction. The tension is crazy from the start, as Season 5 begins with "Then." - When? Presumably sometime in the past. We can hear screaming from another room, while a group of people are huddled on the floor of a dark room. Someone's asking what the hell they were thinking bringing these people here. Garrett, whom we met at the very end of Season 4, responds that they were trying to do something good. They were trying to be human beings. Is whatever's going on out there the explanation for the words "Never again. Never trust. We first, always," which were seen on the walls of Terminus at the end of last season? Has this group been betrayed so brutally by other people that they've turned against the rest of the world in order to protect their own? Whether or not that turns out to be the case, there's definitely a story being revealed here. Cut to "Now" when Rick and his people are in the railroad car, getting caught up on the things they missed while separated. All the while, their hands are busy at work, preparing for their chance to defend themselves. A few seasons back, these people might have been huddled together, fearing what awaited them. But these characters are a bit more hardened by the world around them. If they're going down, they're not going down without a fight. But instead of being met by Terminus people, they're met with gas, which eliminates their opportunity to fight back. 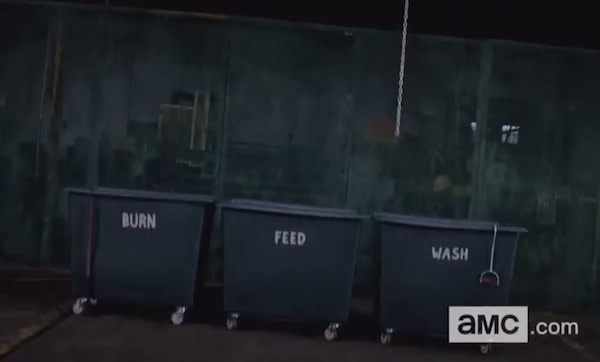 What goes into "Burn" and "Feed" and "Wash"? Something tells me we're going to find out. Not everyone who's there against their will is part of Rick's core group, but -- and feel free to correct me if I missed something -- they do all appear to be men. You know that the blonde guy on the end is in trouble, because they focus in on him. 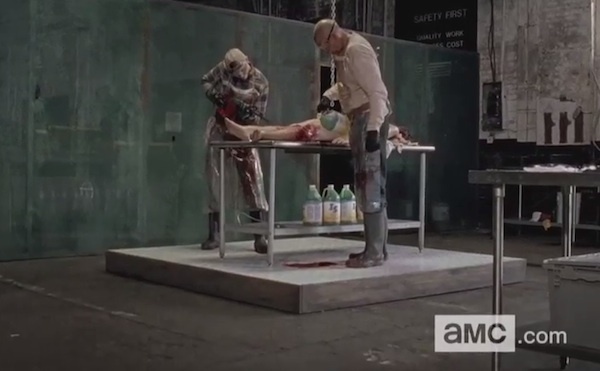 He immediately looks like the example of what's about to happen, and whatever it is, hopefully won't happen to Rick, Glenn, Daryl or Bob, all of whom are in the same line. They're forced to kneel over some kind of troff and the blond guy takes a bat to the head. That's where the scene cuts out. What will happen from there? We'll have to wait until Sunday night to find out. The Walking Dead Season 5 airs Sunday at 9:00 p.m. EST on AMC.